Just want to share the pics of NYX Concealers so that you can compare the colors. 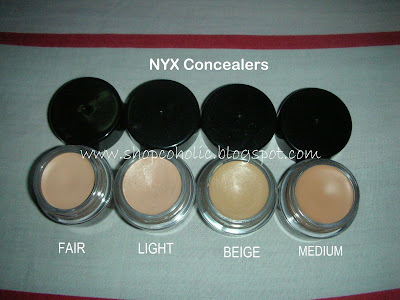 For my NYX Concealer in a jar review, click here. 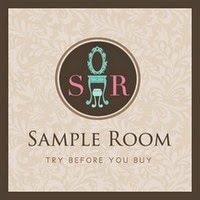 *Note: based in MY opinion only..
For the Light, Beige and Medium Swatches, click here. 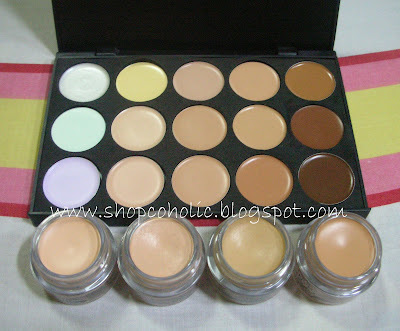 The Jessie Glova 15 pc Concealer palette with the NYX Concealer in a jar. The NYX Colors are really dupeable.. See?! In terms of coverage, the 15 concealer palette reminds me of the MAC Studio Finish concealer, that has a "kinda" dry coverage compared to NYX. thanks for commenting nikki. actually the fair and medium di akin yun. just took pics of it hehe.. Thank God I found your blog! I've been struggling to find a perfect match for my skin, I have the exact concealer palette like yours and wanted to buy NYX above & beyond concealer but having a problem decide which one suit me best, I usually use the third one from the left (3rd row), so the row you have purple/pink corrector, I'm using the third one. could you please tell me which of one from NYX above and beyond concealer suit the third one on the palette best?